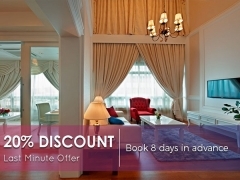 Enjoy 20% discount on your room for any last minute booking, plus international breakfast buffet! Modification: If you choose to modify, you will be charged the total room charges. Cancellation: If you choose to cancel, you will be charged the total room charges. No-show: Guests who do not arrive within 24 hours of the check-in date and time of the hotel will be charged the total room cost of the reservation. Card Fraud Control: To protect credit card owners from fraud, the guest is required to present the actual credit card used in making the online booking and a valid government issued PHOTO ID of the card owner upon check-in. The hotel reserves the right to refuse the guest to check-in for failure to comply with this requirement. If the card owner is not the one staying at the hotel, the guest is required to present clear photocopies of the front and back of the credit card used, a valid government issued photo ID of the card owner along with an authorization letter stating that the credit card holder has allowed the guest to use his/her card for the reservation. The hotel may cancel a confirmed reservation if a booking is suspected to be made using a fraudulent credit card. Children Breakfast Policy: Complimentary buffet breakfast for child below 6 years old. Half price to be charged for child aged 6 to 12. Durian Policy: Durian fruits are strictly forbidden in our hotel. Extra Bed: Extra bed are available at RM130.00 nett (with 1 breakfast) and RM110.00 nett (without breakfast). Hotel Policy: Connecting room are available on request & subject to availability. Non Smoking: Non smoking room is on request and subject to availability. Pets Policy: Pets are not allowed in our hotel. Check out The Royale Chulan Damansara for more details about this offer and to book your accommodation now!